This luxurious Penthouse is superbly appointed, elegantly furnished and boasts an extremely large terrace, ideal for taking in the sun and the view of the Mountains and the Bay. A PRIVATE LUXURY VILLA ON THE NORTH COAST OF THE DOMINICAN REPUBLIC Owned by a Boston family, this charming, open-to-the-outdoors house has three bedrooms and two full baths. The kitchen is well-equipped, and the living room and dining room are comfortably furnished, with a water view. Welcome to the only Condo Boutique Hotel in Santo Domingoâ€™s historical Colonial City! The Boutique Hotel Palacio is located in the heart of the Colonial District. 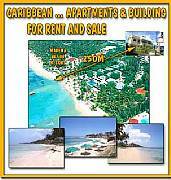 This property is located in Juan Dolio, Villas del Mar - Caribbean Coast. Beautiful Two Family House For Sale Near All! It is right off the "Avenida de las Americas", the central "freeway" that connects the airport to the capital. The exit "avenue" to the house is "Salida Mexico". It is about 20-25 minutes from the Santo Domingo airport, about 20-25 minutes from the capital, and about 30-45 minutes from the "Boca Chica" Beach and other Beaches and Resorts. Excellent Opportunity! Low Down, Owner Will Finance! Sold! SOLD! SOLD! SOLD! Thanks for your interest! Very nice bright one bedroom already furnished condo just minutes from the beach in Sosua (beautiful North Coast of the Dominican Republic), balcony with ocean view. Seller motivated and willing to finance with low down payment of only $5,000! Lush tropical gardens. A very private property, a family owned two-bedroom apartment with two bathrooms (one en-suite), a large lounge and an open plan kitchen, and a large balcony, it enjoys a picturesque 180 degree uninterrupted view of the ocean. This is the best managed condo building in Sosua. There is a full time english speaking staff (including rental office) to help you - not only with the condo but with every aspect of settling into the Dominican Republic. The maintenance fee is $295 per month. Unique completely renovated 2 story colonial house in the heart of the old city of Santo Domingo, in the most trendy street where most of the famous movies has been filmed as "God father 2, Miami Vice, The Good Shepard....". Walking distance from restaurants, bars,clubs and supermarkets. 95 square metres sea view roof terrasse can be use as a living space. Villas Palmeras is a gated beautiful community of 12 spacious and luxurius villas with two stories of 1,707 sq ft (160 m2) and 1824 (171) each, to a walk distance from the white sands and blue turquoise waters of El Cortecito Beach at Punta Cana, with amenities as pool, garden gazebos, private parking, barbecue, with 2 and 3 bedrooms, 2. Construction has just completed and Villa Rosada is the most luxurious perfect OCEANFRONT vacation residence in Cabarete, with its own private soaker Hot tub, (uniquely located on the roof), and infinity pool with glass block stairs leading to your bedroom patio with other comforts you will not soon forget. We would like to present the opportunity to purchase 2 villa's in the beautiful and prestigious community of Guavaberry Golf & Country Club on the outskirts of Santo Domingo Dominican Republic. We think the opportunity is right for you. Our project currently consists of two houses that include 3 bedrooms, three bathrooms, ample kitchen, pool, maid quarters, pool, Jacuzzi and much more. 203 Rooms, 11 villas, Restaurants, Pool, Jacuzzi. Club, Bar and Gift Shop areas. Tennis Court, Large Parking Lot, Green Areas, gazebo and beautiful ocean front views. Luxury Villa of 397 m2 and a lot of 978 m2, Modern â€“ Mediterranean architecture. First floor with lounge, studio and kitchen that integrates with the terrace and patio. Water mirrors at the main entrance and the terrace. Full bathroom that can be integrated with the studio as an optional bedroom. Al the doors and windows in fine wood with glass. Italian Kitchen cabinets. Beautiful Condo, Stunning Views, Sosua. Beautiful two bedroom, two bathroom condo set in attractive gardens and stunning views of the bay. The complex has 24 hour security and is a ten minute walk to the lovely Sosua beach. A great investment opportunity, probably the last under 100.000 dollar beach front condo apartment in Cabarete! within a safe community with 24 wireless internet and porter services, The best location perfect for kitesurfing from your front door. Good rental potential, have rented for the past 3 years well and can sell with my rental contacts included, low condo fees. AGUA DE COCO,our exclusive series of allotments, is only five kilometres from LAS TERRENAS and is bounded by PLAYA BONITA and its bars, restaurants and hotels, only 250 metres from the sea in the bay of COSON, one of the most beautiful bays and beach areas in the world. Beautiful house on Dominican Republic, 30 minutes form the capital center (Santo Domingo). Located in a mountain area with a small creeck with water year long, breathless mountain view and city view, Jaquzzi spa for 16 persons installed on a deck that addresses the entrance, living room, dining room and kitchen, with a barbecue located just on the deck. Ground floor units are 87 sq. m/ 936 sq. Ft and equipped with bedroom, bath, kitchen and living area. Sliding glass doors lead onto a spacious balcony overlooking the complex,swimming pool, gardens and oceanside view. All the Coral Crest condominiums are made of a durable concrete design to resist the elements. Hight quality windows forenergy/acoustics, italian modular kitchens, fully furntushed. This home was purchased and refurbished by an award-winning American architect and well-known German Interior Designer. The 7000 square-foot, 4 bedroom, 4-1/2 bath residence is offered fully furnished and includes everything needed to move in and enjoy life immediately. Villa Playa Laguna is a spacious seaside villa with cathedral ceilings, set in a 1,500 sqm(16,175 sqf) lot, surrounded by lush tropical gardens, with a large private pool and a few steps from a secluded semi-private beach. Ocean Dream is the most prestigious development in Cabarete, Dominican Republic - the Caribbean's top water sports destination. Frequently home to World Cup and Grand Prix events. Ocean Dream was the event headquarters for the 2005 Kite World cup event. Consistent trade winds year round make Cabarete the choice of all keen windsurfers and kiteboarders. This new villa has everything you could ask for. Spacious, luxurious and affordable. it has high ceilings, 3 large bedrooms with 3 full bath, plenty closet space,tiled floors, gated, circular driveway, large patio, terrace, pool, 24 hour security, beach front community. only 20 min from Puerto Plata Internacional airport. El Marinique is nestled on a small bluff overlooking the beautiful twin bays of Las Galeras and Rincon located between majestic Cape Samana and remote Cape Cabron. Just a minuteâ€™s stroll from the main beach of Las Galeras, the hotel is located one block from the center of the small, rustic-fishing village at the north-eastern tip of the Samana peninsula. Lovely Hi-Floor Condo Is The Perfect Getaway! Studio Condo on top floor of luxury building in Sosua with excellent views of the town and ocean. Private and secure residential building with swimming pool. Located on quiet street close to restaurants and supermarket. The beach is just a 5 minute walk away! Condo is completley furnished with an eat-in kitchen that includes all appliances. Offered at $39,900. Villa Flying Cloud is a one of a kind luxury Caribbean vacation villa. Located in breathtakingly beautiful Orchid Bay, the villa offers the promise of a truly exceptional vacation stay. Sited less than 100 yards from the sea,wrap around verandas on two floors provide stunning 360 degree views of both the ocean and the lush forested hills.